Patio doors have come a long way from the simple sliding doors of the 1960’s. 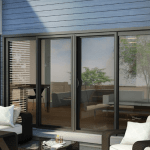 Today’s patio doors can be a more modern version of those sliding doors with better insulation and UV protection, to full glass wall systems that bring indoor-outdoor living to a whole new level. 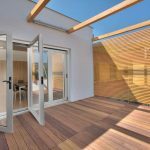 If you’re shopping for a new patio door, or looking for ideas for a new home build, it’s worth taking a look at what’s possible, because there are some really innovative concepts available now. Engineering has made it possible to span large distances with doors that can open almost the entire way. There are 3 main types of patio doors: The classic sliding door system, french doors, and glass wall systems. We’ll take a look at what makes each unique, and the benefits of each style. Although we’re looking at the main styles here, it’s always best to contact us as we’re a custom window and door manufacturer and can make almost any vision come true. The sliding patio is door is easily the most popular due to its familiarity and ease of install. In condo buildings or townhouses with limited space, they’re used almost exclusively. Sliding doors are extremely reliable and do a great job at insulating your home and keeping the weather out. 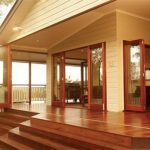 The major benefit of sliding patio doors is the space saving nature of them. You usually get two to four large glass panels, one of which is on a sliding track system. These types of doors will give you a great view of the outdoors. 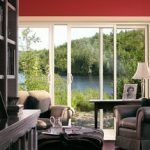 We offer several patio door systems that fit the styles of most homes, and they’re the perfect balance between budget and function. 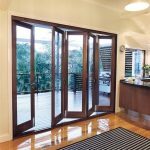 We’ve done an entire article on whether or not french doors are for something you should consider. Check out that article to get all the details on if they’ll work for you. The main reason you’d consider french doors is that it fits the style of your home, and you want doors that open up the entire distance of the frame. French doors can also be installed in pairs to create a wall of doors to open up your space. They don’t create quite as much open space as a glass wall system, but it may fit the look of your home better. The one area you’ll need to put some thought into with french doors is whether or not you have enough space for them. They do require room to swing to open. The weather proofing has come a long way, but you’ll also want to make sure you’re working with a quality manufacturer, as cheaper installations have been known to leak. A glass wall system for patio doors is really the best of all worlds when it comes to patio doors. Glass wall systems like our Villenew and Overture lines will allow you to open up entire walls to the outdoors. Glass walls look large, but they actually save more space than french doors due to the unique track systems. They’ll usually be able to open in a way that compacts and gives you a large seamless indoor-outdoor space. The only downside to glass wall systems can be price – Not so much in the cost of the unit itself, but in the structure required to support them. Usually they span significant systems and are more often used in new builds where the structure is reinforced during framing. If you have any questions or want to see examples of what we can do for your home, check out our showroom and speak with one of our advisers who can you show all the possibilities!